I think there’s an open seat at the Scientology club! Jessica Alba has just signed on to star in a horror film, The Eye, for Tom Cruise’s production company. Jessica signed this $4 million dollar deal, but all the Scientology jokes that will comes from this? Priceless. There is no word yet if Tom Cruise will co-star in the film, but either way phonebooks are already being stacked on all the chairs on the set so Tom can feel like “a big boy” when he sits down. They are starting to film this next month in New Mexico, so if you see Katie Holmes going “south” with Tom you’ll know why. I don’t know if this is a good move for Jessica. I think I’d stay clear of the “Tom Cruise Train Wreck of Horror” for a while. Although, I typically make the wrong decisions so maybe she should go with the opposite of what I say. 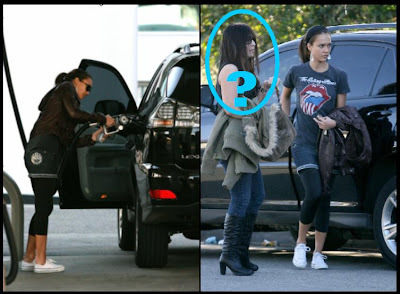 By the way, these photos are of Jessica Alba pumping gas in LA yesterday….riveting, right? Well, the thought of Jessica “pumping” anything is pretty hot, so just go with it. Who Shot That!?! and Who Said Horror Flick!? !